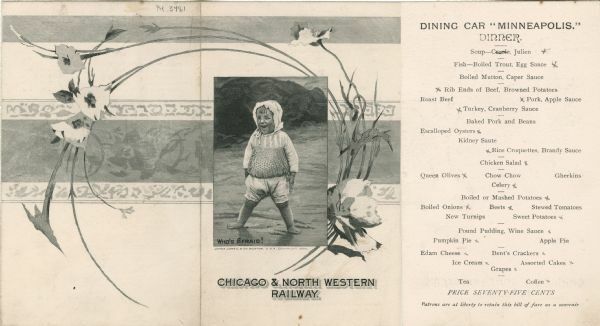 Menu from the Dining Car "Minneapolis" on the Chicago & North Western Railway, with an illustration of a child in shorts, a loose top, and a bonnet standing barefoot on the shore, with rocks and the water in the background, with the caption, "Who's Afraid!" superimposed on a decorative border and encircled by flowering stalks. A wine list (not shown) faces the menu page.